Former President of Ghana, Jerry Rawlings, who decisively fought corruption in the West African country, has called for a global campaign for the return of Nigeria’s stolen funds stashed away in developed countries. While requesting the international community to spearhead the initiative in a manner similar to the advocacy for the release of the kidnapped Chibok girls – #BringBackOurGirls, he charged developed countries to pay more than lip-service to the return of the funds to Nigeria and some other countries. 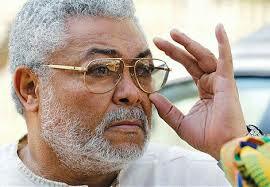 Rawlings told The Guardian in Ghana that “The high-level London conference on corruption offers an opportunity not only for countries in Africa and the developing world to revise and enhance their strategies for combating corruption, but also for developed countries whose banks have served as a safe haven for stolen wealth from Africa and elsewhere to repatriate those funds. The anti-corruption crusader went on to slam the developed countries who organise anti-corruption workshops with no concrete action to address issues that concern them. His words, “Let us stop this support and mere conference of words and follow up with serious deeds. The commitment to corruption should work both ways. Developed countries cannot continue to harbour illegally-acquired funds from Africa and expect the latter to successfully stem the source of corruption. “If we could transmit the integrity from our culture and various languages into the Western language and behaviour we’ve adopted, we could end up restoring the needed level of integrity to create a more civilised behaviour. In other words, we will be restoring integrity and credibility back to the spoken word. “Let me speak about these characters corrupting us and sending our loot into their economies as part and parcel of their capitalist programme. When you begin to speak up, they get nervous. They resent and they don’t like nationalists, pan- Africanists. When the time comes, they would sacrifice you and keep your loot. “Let’s put pressure on those African governments to bring those stolen monies out. Obama and his friends should give them sleepless nights just like the way we handled the Chibok girls’ issue. Let’s go beyond roundtable meetings. The Commonwealth should be made to serve a better purpose. This calls for a loud noise. “From London to Switzerland, they are holding on to these stolen monies with impunity. More pressure is needed from all angles. Obama, the whole lot of them should pitch in and not do what they are doing in South America, in Brazil. Some of us can see through it.